I don't know much about ES lore, so I may be completely off here. Is there any way they could have it set on an continent besides Tamriel? You would think that would give them a lot of freedom to create and take advantage of the map sizes that the next-gen consoles will allow. If not that, maybe it would be interesting to have two provinces included? For example, maybe Valenwood and Elsweyr could be together, since from what I understand they might not be enough to sustain a game on their own. I'm just thinking we're going to see a very large map for ES6, since Todd Howard has said https://www.pcgamer.com/bethesdas-starf ... dd-howard/ that the technology hasn't existed for the ES game they wanted to make. [...] When you chat to the priest Lloros Sarano in the Ald’ruhn Temple, the dunmer says “I’ve heard rumours that Akivari is making preparations to invade us again. They are apparently only waiting for the Empire to collapse in Civil War or some other crisis. We’d certainly need a Hortator then - if we had one, maybe they could travel to Akaviri before the invasion and weaken or stop it”. Yeah. I’ll just give you a moment to read that again. The first part of Lloros’ rumour has already come true. Skyrim Special Edition is centered around the Civil War between the Stormcloaks and the Imperial Empire. Rebelling against the White-Gold Concordat (the peace treaty signed between the Third Aldmeri Dominion and the Tamrielic Empire), the Stormcloaks want the Empire out of Skyrim and honor Talos (otherwise known as Tiber Septim), the Emperor-turned-god whose worship is forbidden in the White-Gold Concordat. At their head was Ulfric Stormcloak, who killed/murdered (depending on which side you take) the former High King Torygg in a duel. On the other side you had the Empire, who want to continue ruling Skyrim and are supported (or, ahem, monitored) by the Thalmor, powerful representatives of the Third Aldmeri Dominion. Right. So, all that mess basically adds up to one giant Civil War. With the Empire focused on regaining control of Skyrim, their already-vulnerable position certainly isn’t helped by the fact that the culmination of the Dark Brotherhood questline has you assassinate the current Emperor, Titus Mede II himself. The Empire is about as weak as it’s ever going to get, making it the perfect time for the Akaviri to strike. 1. Akavir, east of Tamriel, is inhabited by four races, none of them Men or Mer: snow demons, vampiric serpents, monkey-people, and cat-people (who may or may not be related to Khajiit). 2. Atmora, north of Skyrim, is said to be the original home of Men, who were led to Tamriel by Ysgramor. There were Mer there as well, but its climate changed, and it's not known whether it's now too cold there for life to exist or not. It would have been nice if Todd could/would have confirmed the setting for the game but I'm still stunned by what he did reveal. 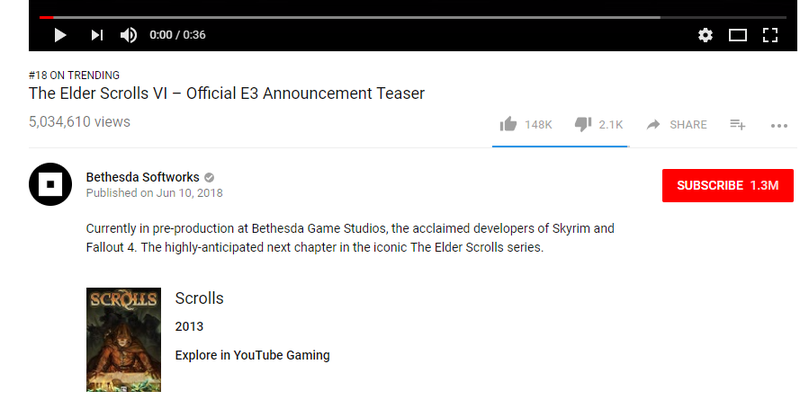 He's always been very tight-lipped about what Bethesda was doing so I'm hoping that this will be the start of a new approach to releasing information about game development by the studio. I don't know that they'll ever show work-in-progress as smaller studios do. But giving more of a heads-up about projects... that's a nice change. There sure do seem to be some big potholes around that desert. And clearly the biggest landmark in the trailer is that giant crater with the keep atop one end. If you squint, you might be able to imagine something like that on the Summerset Isles map, but maybe not. But there's perhaps another clue in the trailer: look at the color of the title at the end of the trailer. That gold color seems not too dissimilar from the color of a desert. Obviously this is all speculation. Any other theories? Maybe the game is set in more than 1 province (maybe even all of Tamriel?) and that's what they meant with "the technology for what we want isn't there yet" a few years back. As to the setting for TES VI... I continue to think the Summerset Isles, and a focus on the Thalmor, makes sense. It's still my hope that this will be the case, Flat. I never much cared for the civil war aspect of the game preferring to remain neutral in the conflict but my Nord character has a deep and abiding hatred for the Thalmor. It would give me much pleasure to see a resolution of this conflict. Love the inclusion of the maps by the way. 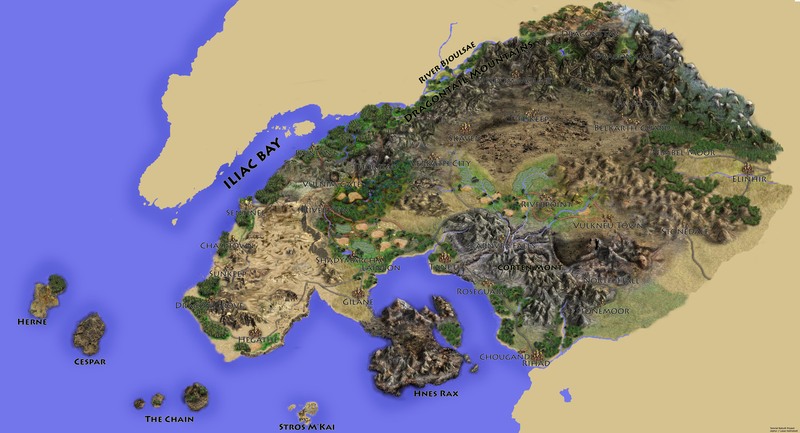 It's a possibility, Dino, although I doubt if they would want to cover the whole of Tamriel in one game. Todd was still proving to be somewhat evasive concerning the technology issue so his references to "the technology" could mean anything. I hope whatever he means doesn't turn out to be an expensive gimmick. I would like to see a different TES, for once. Personally I find the story about the Falmer and the Dwemer very interesting. I would like to see the next TES set in the underground, with occasional excursions on the surface (pretty much the opposite of what we got until now). Being confined in limited spaces with limited draw distance (for most of the time, at least), should allow for a ludicrous level of detail for just about everything on screen while keeping the system requirements low. Imagine how gorgeous it could look. Listening to Todd talk, I got the strong impression that by "the technology" he wasn't talking about physical computing tech, but rather about some sort of software infrastructure -- some kind of support system for Bethesda-style gameplay that's not currently available via some off-the-shelf tool/library. If I had to guess, that's something like Radiant 2.0: an AI system that empowers NPCs to live more interesting lives, but within the context of the major and minor and procedurally-generated stories that Bethesda wants to tell in their open-world games. There are AI systems you can buy now, but they don't necessarily integrate neatly into using characters to support storytelling in an open world. I could see BethSoft wanting to push more on that than on, say, another iteration of terrain streaming tech. Another possibility would be procedural content generation. (This would actually hearken back to TES: Arena.) Rather than having to rely on modders to extend the life of the game by painstakingly building out new dungeons, if BethSoft built a really strong new PCG technology, that could ensure there are always interesting new places to explore. This would free up modders to focus more of their creativity on objects and systems. Or it could be something else. It just didn't sound like "computing tech" to me. What I'm wondering is whether we'll see any hints of it in Starfield. I would like to see the next TES set in the underground, with occasional excursions on the surface (pretty much the opposite of what we got until now). If you've played the two Metro games so far, what did you think? And did the announced Metro: Exodus appeal to you? Actually... they mentioned in the presentation that some of the dungeons in TES:Blades (the new mobile/pc/console game) would be procedural. Fairly simple probably given the platform, but... a first step? Exodus is on my wishlist, just so I do not lose track of it. I heard only good things about the Metro games, and I am judiciously staying away from spoilers like a balloon does with pointy stuff! After reading Flat's analysis, yeah... That does look a bit like a desert. And I think I could see where it would be in Hammerfell, too. It looks more likely than the Summerset Isles still to me, by a wide margin. Funny note: On the official teaser page on youtube, the description lists the content of the trailer as belonging to Mojang's "Scrolls" game. Remember that big lawsuit? My personal guess is that it will be both Hammerfell and High Rock in one game. That'd be nice. I expect it's either down Elsweyr way, or else encompasses the ENTIRE world.